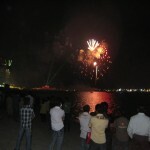 On December 2nd, the UAE celebrated its 39th birthday! In observance, the government and businesses closed down and thousands took to the streets to show their pride. 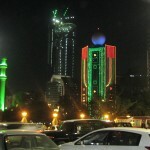 It is a big event for the country, as evidenced by the thousands of lights, signs and displays that began appearing in the week leading up to National Day. 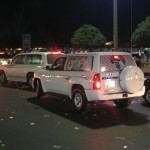 So the “in” thing to do on National Day is to decorate your car with all things UAE and drive up and down the Corniche. Some people beep their horns, some sit on the roof of their car, while others spray silly string and confetti. The atmosphere is very electric and even though we have only lived in the UAE for a few months, Meg and I got swept up in the energy and pride everyone was exuding. Everywhere you looked, cars were decorated with flags, pictures, balloons – you name it! 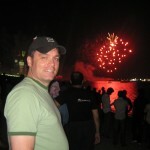 The evening’s festivities concluded with a beautiful fireworks display over the water. 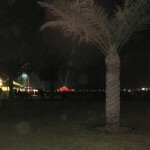 The small building to the left of the fireworks (the one with the lighting display) is the Emirates Palace Hotel. The tower to the far right is Marina Mall.